Archie took those first wobbly steps on his own at only 10 months old and we watched on in shock as this tiny little boy giggled and tottered. He had cruised before he crawled and where Archie was, trouble was not far behind. After Dylan's lazy approach to movement, this child who was so desperate to explore was a shock to the system and his mischievous personality meant we were kept on our toes. It seems that those wobbles were enough for my little man though, as he soon changed his mind and went back to crawling. 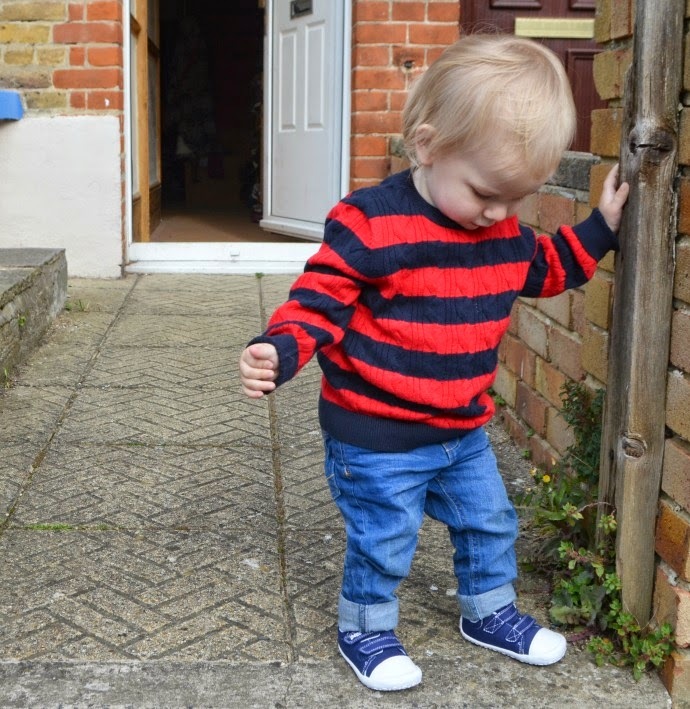 He turned 11 months, 12 months and 13 months still able to take about 5 steps before falling to his knees and crawling off at speed, but as Archie turned 14 months last week, he decided to up the game and push his little legs to the limit. He took a few more chances, let go more often and by the second day he was walking across the room on his own. His smiles show how proud he is of his new skill and I know this summer is going to be eventful and energetic with two little boys who will most likely be running in opposite directions! 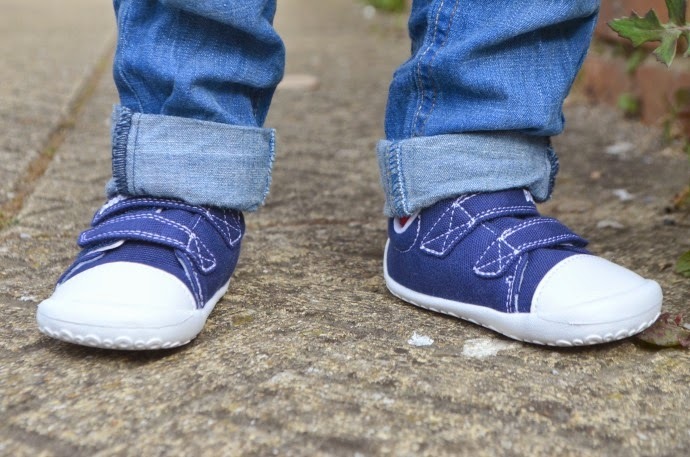 Archie has always refused to keep anything on his feet, but with his new found desire to have his feet constantly on the floor, we have purchased his very first pair of shoes - some blue Clarks Doodles in a dinky size 4. We went for the cruiser version as they looked easier for the little dude to get used to after months of being barefoot, and he looks so grown up with little shoes on! How cute??!! My boys are so funny now both are walking. BB seizes any opportunity to run the moment I take him out of the pram, and CK runs after him to try and block him for me. Both have Clarks doodles too - BB has red and CK has navy and red. Perfect shoes for summer for them. Ah bless, so cute. My 14.month old is running rings around us already!! Once they start walking at all they are gone!! Oh look at them! I can't wait to get Athena measured for her first shoes, she's still at the cruising stage though, and to be honest i'm happy for her to stay that way for a while longer! Oh how cute. Love the shoes. Look at him being such a big boy now. I can't wait until both of mine can walk. Although I agree I think they both will be running in opposite directions. But I have heard it's alot easier when they both are walking together. Going on lil adventures together. Lovely photos. It does make some things much easier, and it is lots of fun - it won't be long until MM is toddling around too!